Professor Michael Hamburger of Indiana University recently finished leading his fourth G188 class through the Eastern Sierra Nevada in California. 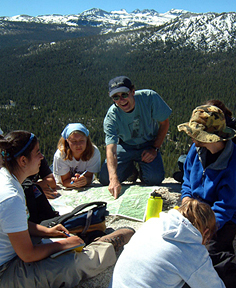 The course, entitled "Volcanoes of the Eastern Sierra Nevada: Geology and Natural Heritage of the Long Valley Caldera", is a two-week summer field course designed to give students hands-on opportunities to discover the geology of eastern California. Hamburger has been teaching the course, along with his colleague John Rupp, Assistant Director for Research at the Indiana Geological Survey, since it's inception in 2002. This year, they were joined by Associate Instructor Anne Hereford in leading students through this "natural laboratory for teaching". Class discussion in Yosemite National Park. Students learn to use GPS equipment in the field. G188 guides just over a dozen students through dramatic landscapes during which students work in small groups, make observations, and take field notes, then reconvene together for discussions and readings. To promote discovery, instructors encourage students to consider the processes and products of the natural environment as a holistic system. The topics explored are therefore not limited to geology; guest speakers expose students to natural historical and environmental issues as well. It is a learning experience that teaches scientific thought and procedures with a subordinate amount of content. The two weeks of intense field work and interactivity also provide a setting in which life skills of cooperation and support are developed. The course challenges students intellectually, physically, and personally and invariably results in many wonderful moments. This year, Hamburger and his students experimented with a new application of GPS using equipment provided by the UNAVCO Facility. 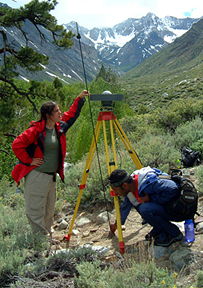 The class used a set of Trimble real-time kinematic (RTK) GPS receivers in order to provide rapid, high-precision measurements of an active fault zone marking the eastern front of the Sierra Nevada range. The one-day GPS campaign provided several hundred GPS measurements, including a series of topographic profiles across the fault and high-precision survey measurements of a network of benchmarks crossing the Hilton Creek Fault. The measurements suggested an intriguing patterns of fault-related deformation. While field courses are not new to undergraduate geology curricula, this course is unique in that it is designed for non-science students. Typically the rosters are dominated by freshmen and sophomores that include one or two geology students, a couple of undecided science majors, while the balance are business, humanities, music, journalism and fine arts students. Judging by the reaction of former students, this class is a great success and in many cases a lifetime experience.